Welcome to Joy McDaniel Academy of Dance and Gymnastics. For the 2018-2019 session classes, a non-refundable $30 per student registration fee is due at registration. For 6-six week session classes, the $58 class fee is due at registration. After completing the following registration information, your credit card/bank account entered below will be charged the applicable fee(s) within 24-48 hours. An email receipt will be sent after your fees have been processed. Please click on the Search button below, then choose the class. Be sure to select the studio location you are registering for. 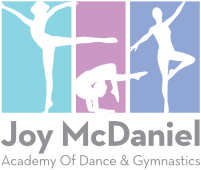 Joy McDaniel Academy of Dance and Gymnastics strives to be a positive, respectful, family friendly dance and gymnastics academy. •	Gossip, intimidation, abuse, or disrespectful comments of any kind about JMAD, its staff, instructors, affiliates, students, and/or parents/legal guardians will not be tolerated whether on or off JMAD premises. •	Any grievances should be brought to the immediate attention of Joy McDaniel (Owner and Director) and not shared with other parents/legal guardians or students of JMAD past or present. •	The failure of students, parents/legal guardians, guests, and any persons associated with the student or parents/legal guardians to abide by these rules may result in the administrative withdrawal, suspension, or termination of the student. •	Students should arrive to class on time, wearing proper attire (leotard, tights, etc. ), and with the appropriate shoes. •	Students are expected to participate in class and behave respectfully toward instructors and classmates. •	Instructors are expected to make every effort to cultivate a healthy and respectful learning environment, and therefore reserve the right to implement class specific policies (including but not limited to: dress code, tardiness/absences, language, and cell phones). It is each individual instructor's responsibility to communicate any class-specific policies to students and parents. •	In regard to disruptive behavior in the classroom, instructors may discipline children by using time outs, or withholding rewards (such as stickers) as necessary. Instructors are expected to communicate with parent/legal guardians regarding disruptive behavior. •	JMAD allows and encourages the use of social media to celebrate the hard work of our students and promote the art of dance and gymnastics. •	Slanderous, explicit, or abusive statements, videos, or posts made on any social media accounts including but not limited to Facebook, Instagram, Twitter, etc... toward, about or in association with JMAD, its staff, instructors, students, Parents/legal guardians, and affiliates will not be tolerated. •	Violation of this regulation may be grounds for immediate administrative withdrawal, suspension, or termination from JMAD. •	JMAD reserves the right to pursue legal action for any slanderous, explicit, or abusive social media posts that may cause harm in any manner to JMAD or its owners, directors, managers, instructors, or employees. •	It is highly recommended that parents/legal guardians supervise the JMAD related pictures and posts on their child's social media accounts. • Good attendance is imperative, as absences and tardiness can hold back an entire class. The studio cannot jeopardize its responsibilities to the rest of the class for one student. • I agree to make every effort to have my child at every class. If my child must be absent from any class, I agree to call JMAD ahead of time to inform them of the absence. • I understand that there will be no refund for any missed classes nor any make-up classes. • I understand that if my child misses 3 or more consecutive classes, my child may be administratively withdrawn and/or unable to participate in the annual recital. • A $30 per student Registration Fee is due at the time of registration. Registration fees are non-refundable. • Tuition is $58 per month for one class. A multi-class discount is available, and is based on the total number of classes per family. A multi-class fee schedule is available on the JMAD website. An additional discount is given to families enrolled in automatic e-payments using a bank account. Due to the rising cost of credit card fees, we are no longer able to offer the auto-pay discount for monthly automatic e-payments on credit/debit cards. • PAYMENT OPTION 1: Annual Payment -Tuition paid in full. A 10% discount off the lowest fee schedule will be given for tuition paid in full for the 2018-19 year by September 5, 2018. This fee is non-refundable. Annual Tuition can be paid at the studio by the first class in August, or by Automatic E-Payment to be processed on August 5, 2018. I understand that by choosing Annual Automatic E- payment and providing my bank account or credit/debit card information, I am authorizing JMAD to debit my checking account or charge my credit/debit card for my annual tuition payment on the 5th of August, and I also authorize JMAD to withdraw funds from my bank account or charge my credit/debit card for the following if not paid in person at the studio by the due date: Costume deposit of $55 per costume on November 15, 2018, the Recital Fee of $85 for one child or $100 for 2 or more children on February 21, 2019, and the costume balance also on February 21, 2019. • PAYMENT OPTION 2: Monthly Automatic E-payments. Tuition paid monthly can be paid by enrolling in automatic e-payments using a bank account or credit/debit card when registering. Families enrolled in automatic e-payments using a bank account will receive an auto-pay discount on their monthly tuition. A $25 fee will be charged to all returned bank drafts. A $10 late fee will be added to all declined/returned automatic payments if tuition is not paid by the 15th of the month. I understand that if my payment is declinded/returned, I am responsible for verifying my account information and making the payment either through the Parent Portal or at the studio. I understand that by choosing Monthly Automatic E-payments and providing my bank account or credit/debit card information, I am authorizing JMAD to debit my checking account or charge my credit card for my tuition payment on the 5th of each month, beginning in August, and I understand these payments will continue until I notify JMAD in writing to discontinue them or at the completion of the dance year in May. I understand that if I need to change this agreement, I am responsible for changing my payment option and/or my account information in my Parent Portal. I also authorize JMAD to withdraw funds from my bank account or charge my credit card for the following if not paid in person at the studio by the due date: Costume deposit of $55 per costume on November 15, 2018, the Recital Fee of $85 for one child or $100 for 2 or more children on February 21, 2019, and the costume balance also on February 21, 2019. • PAYMENT OPTION 3: Monthly Payments at the Studio or on the Parent Portal. Tuition may also be paid in person at the studio each month by cash, check, or credit/debit card or paid on the Parent Portal by the parent/guardian. With this option, tuition for May, 2019, is due when enrolling. Tuition is due by the first lesson of each month, August-April. Monthly statements are not sent out unless the account is past due. A $10 late fee will be added to tuition not paid by the 15th of the month, and a statement will be emailed to the billing contact. A $25 fee will be added to all returned checks. • For students registering after the first of the month, the first month's tuition must be paid in full at the time of enrollment. • I understand that failure to pay tuition may result in my child/children being administratively withdrawn from JMAD. •	In the event it becomes necessary to withdraw a student from a class and/or JMAD, I will complete the withdrawal form available at the studio and return it to the front desk before the 1st of the month. I understand that if the withdrawal is submitted after the 1st of the month, I am responsible for that month's tuition which will be paid by automatic e-payment for those enrolled in e-payments or by the May tuition payment paid at the time of registration for those on monthly payments at the studio. I also understand that I am responsible for any outstanding balance on my account. • I understand that costumes are mandatory for performance in the annual recital and that the Costume prices are approximately $65. I understand that combination dance classes will have two costumes and other classes will have one per subject. I understand the costume deposit of $55 per costume is due November 15, 2018. I understand the costume balance is due February 21, 2019. • I understand that a non-refundable Recital Fee is due February 21, 2019, and that the fee is $85 for one student and $100 for families with 2 or more students. I understand this fee includes a minimum of 3 tickets to the recital. • I agree to pay all costume deposits, costume balances and recital fee by the due dates. I understand that a $10 late fee per costume will be added if fees are not paid by the due date. If any payments become overdue, I agree to make arrangements with the director of the Joy McDaniel Academy of Dance, Inc. to set up a payment plan. I understand that failure to pay the required costume fee and recital fee may result in my child(ren) not being able to participate in the annual recital. I understand a $25 fee will be charged to all returned checks or returned e-payments from Checking accounts. • I understand the ANNUAL RECITAL is Saturday, May 18, 2019 at Germantown Performing Arts Centre. • I understand MANDATORY stage rehearsals will be May 13-17, 2019 (Monday through Friday) at Germantown Performing Arts Centre. Classes with younger students and gymnastics students will be assigned to one of the rehearsal days, but if they are taking more than one class, this may result in multiple MANDATORY stage rehearsal times and/or days. • I understand and agree that all students must be present and participate in MANDATORY stage rehearsals with their class(es) in order to perform in the annual Recital. • I understand school graduation, concert/performance, or other significant event dates conflicting with any of the MANDATORY rehearsal dates must be submitted in writing to JMAD by February 1, 2019 and that after this date, there will be no alterations to the rehearsal schedule. I understand that communication from the studio will be done by email. I agree to keep a current active email address on file at the front desk. I understand that photographs and/or videos of my child/children and/or their class(es) may be taken for the promotion of the JMAD. I agree that they may be used for, but not limited to brochures, literature, newspaper advertising, website, social media accounts, etc. No compensation will be provided for such use. I understand that my child's name will not be included with the photographs, unless the director of JMAD obtains separate permission from me. •	In the event of a life threatening medical emergency involving my child/children, I give my consent for the staff and/or instructors at JMAD to immediately contact emergency services, without seeking any further permission from me, and understand I will be notified as soon as emergency services have been contacted. •	In the event of a non-life threatening accident or illness involving my child/children, I will be notified immediately. In the event that neither I nor my designated emergency contact can be contacted, I hereby give the staff of the Joy McDaniel Academy of Dance and Gymnastics my permission to seek medical attention for my child, including treatment by physicians, hospitals, or any other medical services. •	In such an event, I further agree that the cost of such medical service shall be borne exclusively by myself. •	I further agree to release and hold harmless JMAD, its affiliates, owners, officers, directors, managers, instructors, employees, agents, and attorneys from any and all damages, actions, charges, suits, expenses, claims, obligations, and liabilities from contacting emergency services or obtaining medical services on behalf of my child, from not contacting emergency services or obtaining medical services on behalf of my child, from any decision regarding the nature of an injury or illness involving my child/children, and from contacting or not contacting a parent/legal guardian. •	I have read and understand the JMAD Guidelines included above and have been informed they are also posted in the Studio Policies on the JMAD website. I hereby agree my child/children and I will abide by the JMAD Guidelines. I understand that failure to abide by the JMAD Guidelines may result in my child/children being administratively withdrawn from the classes by the director of JMAD without refund of past paid tuition, recital fee, and costume payments. I understand the JMAD reserves the right to administratively withdraw a student from classes at its own discretion, without refund of past paid tuition, recital fee, and costume payments. •	JMAD reserves the right to change or amend this agreement at any time, and will immediately notify all signees, of any changes should they become necessary. I understand that dance & gymnastics are physical activities that could cause injury. The risk of injury while participating is significant including the potential for permanent paralysis and death, and while the guidelines, equipment and personal discipline may reduce this risk, the risk of serious injury does exist and I KNOWINGLY AND FREELY AM ALLOWING MY CHILD(REN) TO PARTICIPATE AND FREELY ASSUME ALL SUCH RISKS, both known and unknown, EVEN IF ARISING FROM THE NEGLIGENCE OF THE RELEASEE or others, and assume full responsibility for my child(ren)'s participation. I for myself, my children and on behalf of my heirs, assigns, personal representative, and next of kin, HEREBY RELEASE, INDEMNIFY AND HOLD HARMLESS JMAD, their officers, officials, agents and/or employees, teachers, other participants, sponsoring agencies, sponsors, advertisers and, if applicable, owners and lessors of premises used to conduct activities, classes and/or events (RELEASEES), WITH RESPECT TO ANY AND ALL INJURY, DISABILITY, DEATH, or loss or damage to person or property, WHETHER ARISING FROM THE NEGLIGENCE OF THE RELEASES OR OTHERWISE, to the fullest extent permitted by law arising from JMAD's activities. "Activities" include all in-house activities, as well as off-site activities, including, but not limited to nursing home shows, recitals, and rehearsals.